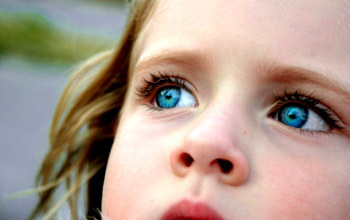 How do children inherit eye color? 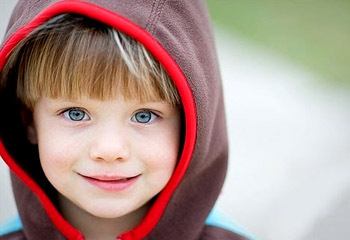 Can a child's eye color be predicted? How can two brown eyed parents produce a blue eyed child? These are questions one may have wondered from time to time. The answer to all of these question lies in the genes inherited from parents. Genes are fundamental to who and what we are! Whether because of its exotic hue or its novelty, blue eyes have long been a subject of fascination for historians, poets, artists, and scientists. Nearly two million species have so far been discovered and named. Yet one gene differs from another only by the sequence of the nucleotide bases in DNA. How does a difference in base sequence determine the uniqueness of a species – for example, whether you are a tiger or a human? Or, for that matter, whether a human has blue, brown, or hazel eye pigments? Genes... they are just incredible! We all possess genes that influence our lives in significant ways. Genes affect our height, weight, hair color, eye color and skin pigmentation etc. They influence our susceptibility to many diseases and disorders and even contribute to our intelligence and personality. Genes are fundamental to who and what we are! The physical and personal traits a person winds up with are just one big roll of the dice, with only the biological parents&apos; genes to draw from. Let&apos;s try to unravel the secrets hidden behind blue eyes. 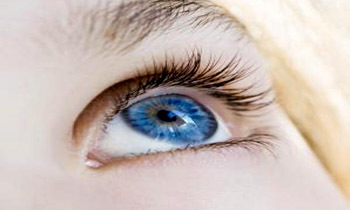 Blue–eyed humans have a single, common ancestor Scientists have tracked down a genetic mutation which took place 6,000-10,000 years ago and is the cause of the eye color of all blue-eyed humans alive on the planet today. By studying the activity of genes in cells, geneticists have confirmed that proteins are the link between the genotype and phenotype. 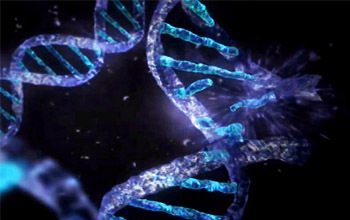 Through its ability to specify proteins, DNA brings about the development of the unique structures that make up a particular type of organism. It follows that you have blue or brown or hazel eye pigments because of the type of enzymes contained within our cells. Thus, people with blue eyes have a single, common ancestor, according to new scientific research. A team of scientists has tracked down a genetic mutation that leads to blue eyes. 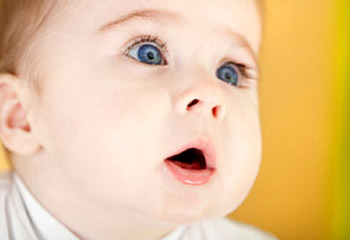 A single genetic mutation gives life to baby with blue eyes. The mutation occurred between 6,000 to 10,000 years ago. Before then, there were no blue eyes. The traits such as brown, blue or gray eyes; black, brown or blond hair are transmitted from parents to offspring through discrete heritable units called “genes” which can be sorted and passed along, generation after generation, in undiluted form. Blue eyes have their hue because of a single genetic mutation Blue eye color in humans may be caused by a perfectly associated founder mutation in a regulatory element. 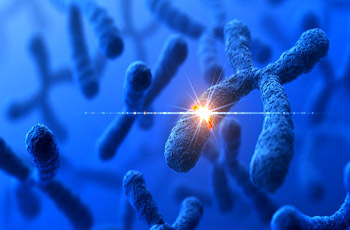 Chromosomes inside the cell nucleus carry the genetic traits through genes and every new embryo formed out of merging of the cells (usually one male and one female) carries half the genes of each parent (genes of 23 chromosomes from mother and 23 from father for total of 46). The sharing of genes from the parents leads to inheritance and the varying dominance of different genes, causes some traits to appear unevenly instead of averaging out. For example, the secret behind blue eyes is genetic mutation. Eye color is determined by the amount and type of pigments in the eye&apos;s iris and the variations in eye color such as blue, brown, green and others are attributed to varying ratios of eumelanin produced by melanocytes in the iris. The melanin content of the iris pigment epithelium, the melanin content within the iris stroma, and the cellular density of the iris stroma contributes to the color of eye. In all eyes, the iris pigment epithelium contains the black pigment, eumelanin. Variation in the color of the eyes from brown to green can all be explained by the amount of melanin in the iris, but blue-eyed individuals only have a small degree of variation in the amount of melanin in their eyes. The color variations among different irises are typically attributed to the melanin content within the iris stroma. The density of cells within the stroma affects how much light is absorbed by the underlying pigment epithelium. OCA2 gene polymorphism, close to proximal 5&apos; – (pronounced“five prime”) regulatory region, explains most human eye–color variation. Blue eyes contain low amounts of melanin within the iris stroma; longer wavelengths of light tend to be absorbed by the underlying iris pigment epithelium, and shorter wavelengths are reflected and undergo Rayleigh scattering. The type of melanin present is eumelanin. 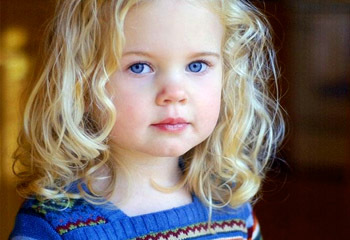 The inheritance pattern followed by blue eyes is considered similar to that of a recessive trait. Eye color inheritance is considered a polygenic trait, meaning that it is controlled by the interactions of multiple genes. Mutation in OCA2 A genetic mutation affecting the OCA2 gene in our chromosomes resulted in the creation of a ‘switch’, which literally ‘turned off’ the ability to produce brown eyes, hence producing blue eyes. Recent research by Hans Eiberg from Department of Cellular and Molecular Medicine at the University of Copenhagen revealed that people with blue eyes have a single common ancestor and that genetic mutation lead to blue eyes while initially everyone had only brown eyes. The study was published in Human Genetics which suggests that a mutation in the 86th intron of the HERC2 gene reduced expression of OCA2 gene with subsequent reduction in melanin production. The authors concluded that the mutation may have arisen in a single individual in the Near East or around the Black Sea region 6,000–10,000 years ago during the Neolithic revolution. Eiberg stated, “A genetic mutation affecting the OCA2 gene in our chromosomes resulted in the creation of a ‘switch’, which literally ‘turned off’ the ability to produce brown eyes”. The genetic switch is located in the gene adjacent to OCA2 and rather than completely turning off the gene, the switch limits its action, which reduces the production of melanin in the iris. In effect, the turned–down switch diluted brown eyes to blue eyes. In humans, brown eyes are dominant over blue eyes The brown eye form of the eye color gene (or allele) is dominant, whereas the blue eye allele is recessive. If both parents have brown eyes yet carry the allele for blue eyes, a quarter of the children will have blue eyes, and three quarters will have brown eyes. Transmission of genetic information in genes is achieved via complementary base pairing. For example, in transcription, when a cell uses the information in a gene, the DNA sequence is copied into a complementary RNA sequence through the attraction between the DNA and the correct RNA nucleotides. Usually, this RNA copy is then used to make a matching protein sequence in a process called translation which depends on the same interaction between RNA nucleotides. Alternatively, a cell may simply copy its genetic information in a process called DNA replication. The duplication and transmission of genetic material from one generation of cells to the next is the basis for molecular inheritance, and the link between the classical and molecular pictures of genes. Organisms inherit the characteristics of their parents because the cells of the offspring contain copies of the genes in their parents cells. In asexually reproducing organisms, the offspring will be a genetic copy or clone of the parent organism. In sexually reproducing organisms, a specialized form of cell division called meiosis produces cells called gametes or germ cells that are haploid, or contain only one copy of each gene. The gametes produced by females are called eggs or ova, and those produced by males are called sperm. Two gametes fuse to form a fertilized egg, a single cell that once again has a diploid number of genes – each with one copy from the mother and one copy from the father. Scientists have discovered that at least eight genes influence the final color of eyes. The genes control the amount of melanin inside specialized cells of the iris. One gene, OCA2, controls nearly three–fourths of the blue–brown color spectrum. During the process of meiotic cell division, an event called genetic recombination or crossing – over can sometimes occur, in which a length of DNA on one chromatid is swapped with a length of DNA on the corresponding sister chromatid. This has no effect if the alleles on the chromatids are the same, but results in reassortment of otherwise linked alleles if they are different. The Mendelian principle of independent assortment asserts that each of a parent&apos;s two genes for each trait will sort independently into gametes; which allele an organism inherits for one trait is unrelated to which allele it inherits for another trait. This is in fact only true for genes that do not reside on the same chromosome, or are located very far from one another on the same chromosome. The closer two genes lie on the same chromosome, the more closely they will be associated in gametes and the more often they will appear together; genes that are very close are essentially never separated because it is extremely unlikely that a crossover point will occur between them. This is known as genetic linkage. Thus, eye color was traditionally described as a single gene trait, with brown eyes being dominant over blue eyes.